In the previous article, we got basic knowledge about Notification Hub and described some methods, which will help to communicate with it. Today, I am planning to show how to build a simple Windows Runtime application as well as a simple frontend application for sending notifications. I am not going to make something virtual. So, I will try to reproduce the application, which I mentioned at the article about Notification Hub vs Native development. It will be Universal application, which will show last information about soccer games and will allow to receive notifications “from the field”. But before we start to write some code we should select a method to communicate with Notification Hub. As I showed in the previous article, we are able to communicate with Notification Hub directly or we can use the Mobile Service infrastructure. These ways are similar but in our case we need to store the archive of messages in Azure because the application should show old messages as well as new ones. That’s why we need to create a table for messages on Azure side. Additionally, we need to create a service, which will help to update the table and we need to think about the security. Therefore, if we use Notification Hub directly, we still need to implement many things but if we use Mobile Services, it can help us and we can avoid additional work. The most important feature of Mobile Services is an infrastructure for data management. Thanks to Mobile Services, we have a simple way to create tables, manage data inside, write own business logic, which will work as a trigger for operations like inserting, deleting etc. Additionally, Mobile Service infrastructure supports some security mechanisms. Pay special attention that Mobile Service API doesn’t allow to send notifications outside Mobile Services infrastructure. That’s why tables and triggers are the most important part of the story. In fact our backend will work with a table, it will just send new data in order to insert it to table but a trigger will help to broadcast of our notifications to registered devices. Therefore, we should start our development with the tables. In our case, we will need just one table, which should store our messages. 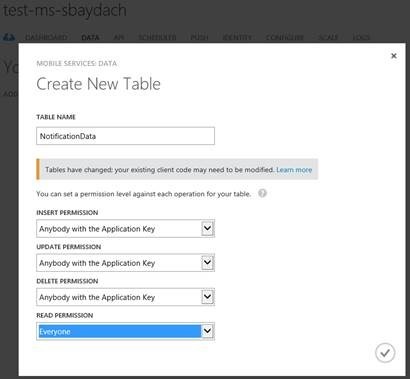 In order to create this table, you can use Azure Management Portal and you will need to set Name and permissions for available actions like insert, delete, update and select. Because we will modify data in the table from our backend only and we are planning to show our archive to all clients without special permissions, we may configure our table to use Application Key for Update, Delete and Insert actions and use Everyone permission for Select action. When you click OK, your table will be ready for your data. However, we did not create any columns yet. If you open Columns tab, you will find several pre-created columns. We may create more columns using the Add Colum button but we don’t need to do it because all tables have Dynamic schema by default. In this code we kept the execute method of the request object but we added a parameter. It’s an anonymous method, which helps to send our notifications. In order to do it we are using push object, which includes several properties like mpns, wns, awns, gcm. These properties contain references to the objects, which can help to send notifications to different notifications servers from Microsoft, Google and Apple. Because we already have some code for Windows Phone (Silverlight) application, I decided to use mpns object but I will show wns as well in the next article. Right now, we are ready to create code which will send messages to the client. Of course, I cannot share partner code inside ASP.NET portal. So I created a simple console application. That is all. Now, we may create a more advanced application for Windows Runtime. I will show how to do it in the next article.